El-P and Killer Mike are still on their promo grind behind their sensational 2013 self-titled debut as Run the Jewels, now fitting their tough-talking eponymous track with some threatening visuals. Just as cartoonish as the hyper-violent brag raps is the video, which presents animated versions of the duo as they spit serious venom. Some textured real-life shots are find Run the Jewels painted a vibrant shade of green, which is fitting once Killer Mike starts hulking out and talking about putting his pistol to your poodle. Though thankfully a dog is never seen, animated or otherwise, a gruesome crimson splash still marks the screen. You can catch the rap intimidators doing their thing down below. 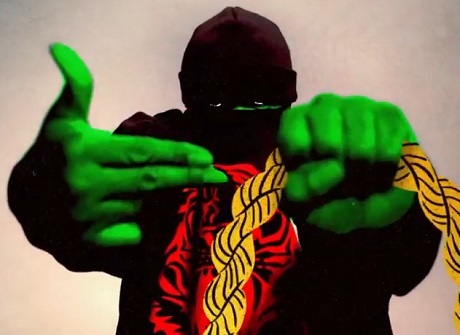 Run the Jewels Drop 'Venom' Track "Let's Go (The Royal We)"